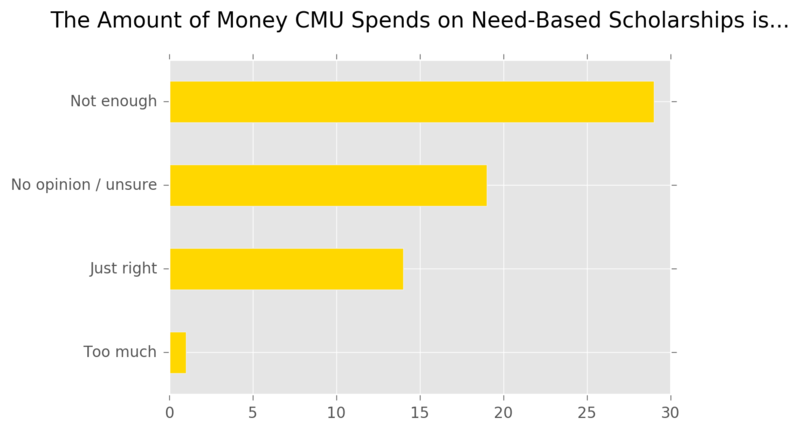 A recent survey by The Tartan of Carnegie Mellon undergraduate students reveals, perhaps unsurprisingly, that students want the university to spend more on financial aid. And no survey is needed to know that students are bothered by the rising cost of tuition, which just this year saw an increase. But spending more on financial aid or lowering tuition would likely require the university to spend less on other budget items. The Tartan conducted a survey this past week in order to gauge the budget priorities of the student body and see where students think changes should be made. To conduct the survey, The Tartan asked what students think about the current level of funding going to research, faculty salaries, buildings, and recreational facilities. Responses were collected from 64 Carnegie Mellon undergraduates via student Facebook groups and, as such, reflect the opinions of a group of voluntary undergraduate responders. Constructing and renovating buildings was the item for which the most respondents said that Carnegie Mellon spends too much money, but even there, more respondents said that the amount of money spent on buildings is “just right” over “too much,” and many respondents were unsure or had no opinion. This indicates an area where there is a fraction of students who think that the current expansion is too much, but a significant portion are not too concerned about the level of funding. One issue with adjusting the money being sent to this area is that many donors donate funds on the understanding that they will be earmarked for a certain physical location where a plaque can be erected with their name on it, rather than more abstract needs for funding at the university. 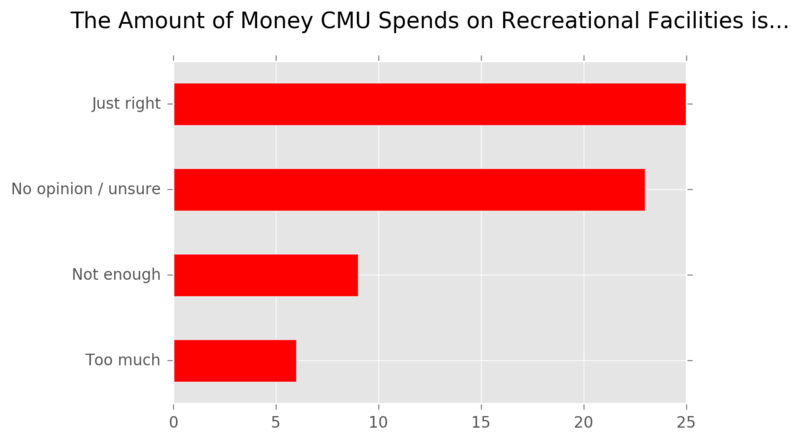 Very few respondents believed that Carnegie Mellon should change its spending on recreational facilities, faculty salaries, or research. However, many respondents were unsure or had no opinion about spending in these areas as well. This might show that this is an area where undergraduates have less of an idea how much is being spent, and those that do are satisfied with current levels. With faculty salaries in particular, the large majority of respondents were unsure or had no opinion. Paying faculty more might allow Carnegie Mellon to recruit better professors, or to lower class sizes by hiring more instructors. 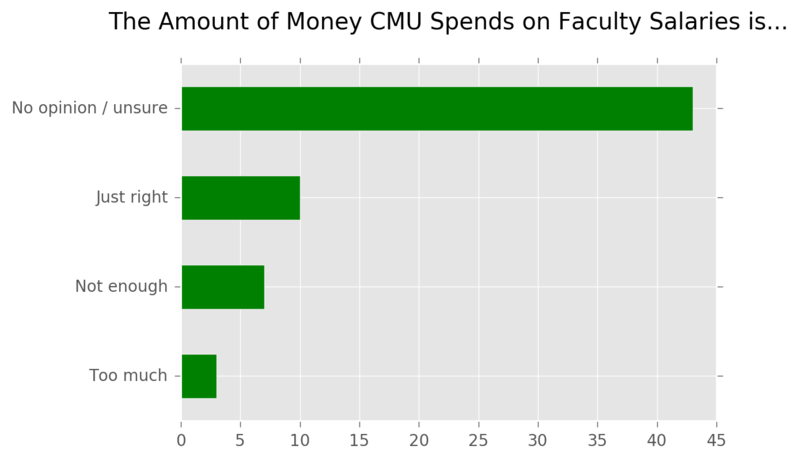 But like any spending increase, raising spending on faculty salaries would likely require raising tuition, and that is sure to be unpopular among students. We also asked Carnegie Mellon students about their opinions of merit versus need-based scholarships. 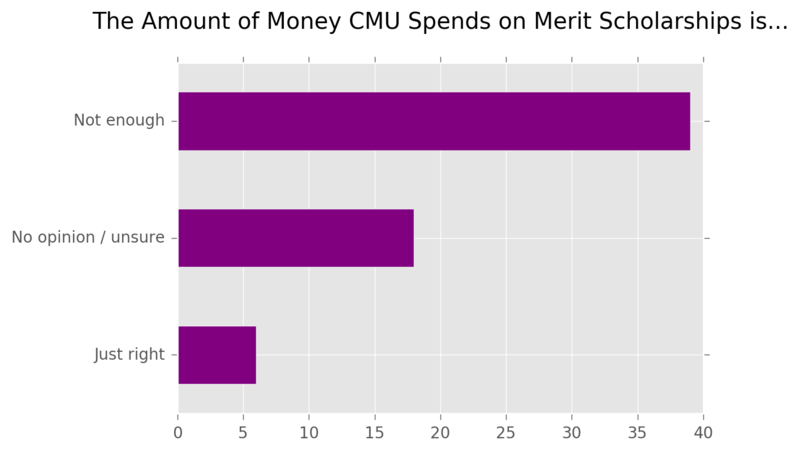 While there is support for increasing both, increasing merit scholarship funding is more popular. This might be due to low eligibility for need-based scholarships among survey respondents, although the survey did not ask about respondents’ scholarship eligibility. It is surprising that nearly a quarter of respondents believed that the amount of money spent on need-based scholarships is “just right,” given that Carnegie Mellon lags behind peer institutions in this area. While many universities, like Massachusetts Institute of Technology, Northwestern University and many more, meet all of a student’s demonstrated need, Carnegie Mellon does not. Along a similar vein, Carnegie Mellon is notable among top colleges for not participating in the QuestBridge program, which matches high-achieving, low-income students with elite schools offering them full scholarships to attend. 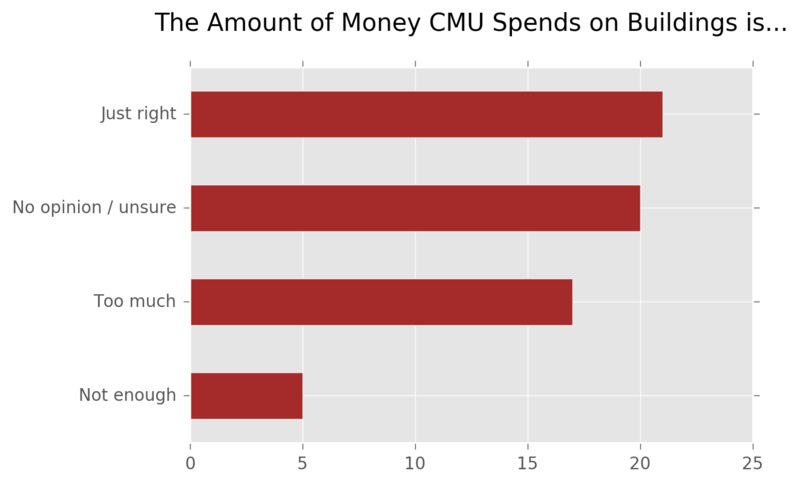 Any change in Carnegie Mellon’s budget would require tradeoffs to be made. 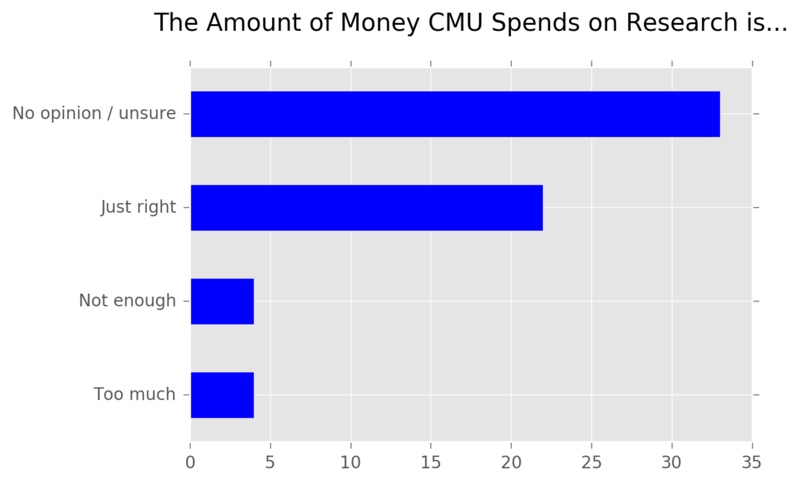 And while ideally Carnegie Mellon would be able to spend more in every area where students feel there should be more spending, in reality administrators must carefully consider which items to prioritize when making decisions about the university’s budget.